DA NANG (VNS) — The central city's investigation police have arrested four persons for violating forest exploitation and protection regulations in the special-use Ba Na-Nui Chua zone. 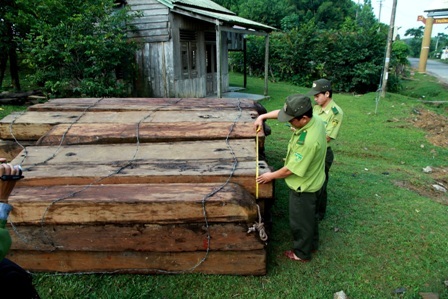 Colonel Tran Phuoc Huong from the city's public security department yesterday said four employees of the Ca Nhong ranger station in Dong Giang district, Quang Nam Province, were arrested for their poor management and irresponsibility in dealing with illegal logging in the area last year. He said the arrested persons – Kieu Ngoc Quy, 60; Kieu Ngoc Trung, 35; Pham Phu Cuong; and Nguyen Van An – discovered 43cu.m of cut timber in the forest of the sub-regions in Ba Na-Nui Chua border area of Quang Nam and Da Nang last October. The endangered timber species of Hopea pierrei and Afzelia xylocarpa, which are mentioned in Red Book of Viet Nam, had been cut and processed by illegal loggers. However, these rangers did not report it to the ranger administration for investigation. Covering 17,640ha, Ba Na-Nui Chua is a well-preserved primeval forest with 543 flora species and 256 fauna species, including 44 kinds of wild animals listed in the Red Book of endangered animals, such as tigers, leopards, wolves and Malayan bears.